Years ago I stumbled upon a website selling replicas of the Warrior Alien from the A L I E N films. My dream was (and still is) to win the lottery, order 100 of them, and scatter them on birq’s block for his shocked neighbors to find one Saturday morning. I was tipped this morning that the ORIGINAL 1979 Alien Suit designed by Swiss Surrealist H.R. Giger is going up for auction in a few days. Some lucky person with more sense than money money than sense is going to end up with a piece of movie history (and quite possibly the best Halloween costume imaginable.) Full press release after the jump. H.R. 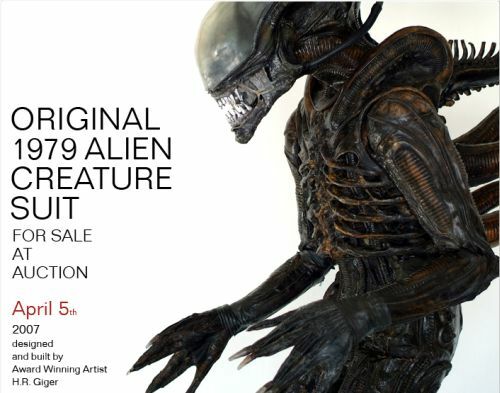 GIGER ALIEN CREATURE SUIT UP FOR AUCTION. In Space, no one can hear you scream! In 1979, that was the harrowing message and tag-line announcing Ridley Scott’s ground-breaking Science Fiction thriller Alien, an original and disturbing vision in modern cinema and a far cry from the glamorous looking Sci-Fi Motion Pictures, audiences had been presented with until that point. Featuring an Alien creature unlike anything ever to be introduced to the silver screen, combined with a unique and hostile alien landscape, the film became an instant classic and holds up in its intensity to this day, nearly 30 years later. The terrifying Alien Costume, designed and created by acclaimed Swiss surrealist artist H.R. Giger, will go on the auction block on April 5 at renowned auction house Profiles In History. One of the most important Science Fiction artifacts ever to be sold, the suit is estimated at $ 100,000-120,000. While only 15 years ago, the art-collecting world paid little attention to movie props and costumes, the Hollywood memorabilia market has in recent years skyrocketed. More and more private investors, speculators and baby-boomers, many of whom are now in the high earning bracket, are competing with museums and other institutions for ownership of a 3-dimensional piece of Hollywood history. A subsequent upsurge in Auction prices for important Hollywood artifacts has in recent years become very evident, and owning a piece of history now has its price: A Starship Enterprise Miniature model recently sold for $ 500,000+, the Cowardly Lion costume from The Wizard of Oz for $ 750,000+ and Audrey Hepburn’s dress from Breakfast at Tiffany’s – estimated at $ 135,000 – sold for $ 800,000. Giger’s Alien, for almost 3 decades now, has influenced and inspired numerous filmmakers, designers and Special FX artists and not only represents a classic and Academy Award-winning movie costume, but an investment-quality original piece of Fine Art, designed, sculpted and painted by the world’s leading airbrush artist, whose intricate, bio-mechanical designs are famous the world over. A very important artifact to the Science Fiction, Fantasy and Horror Genre, as well as a rare opportunity to obtain an original H.R. Giger Art piece, the Alien suit is expected to fetch several times its estimate. Detailed information on the costume, along with the film’s prop harpoon gun, used to expel the creature into space in the film’s finale, is available at www.gigeralien.com. The final hammer price for the Alien is anyone’s guess. What we do know is: On April 5, 2007, at Profiles in History, EVERYONE can hear you scream! UPDATE: The suit sold for $126,500 (including buyer’s premium).